When the announcement came across the speaker that Annette Bednosky was about to be the #1 female (and 13th overall) for the Western States 100, many west coasters looked at each other and said, “who’s that?”. But the east coasters knew better – North Carolina-based Annette may be new to the ultra scene, but she’s a formidable contender in any race. Her performances at 2004 Massanutten Mountain 100-miler (1st female), 2 times winner of the Mount Mitchell Challenge 40-miler, and 3rd place finish at the 2004 Mountain Masochist 50-miler showed she had the mettle. Now with her 18:39 finish at Western States where she and pacer Kami Semick set a pace no female racer could match, she has claimed a spot among the great ultra runners. After constant harassing ;-) from her massive fan base in North Carolina and Virginia, I sought out Annette for a brief interview. Congratulations on an extraordinary finish at Western States. Did you have any idea that #1 female was within your grasp? As I began my training for WS I looked at former times and saw that if I wanted to be competitive (place top 3), I would have to finish in under 20 hours at least. I worked hard with my training, and attended training camp over Memorial Day Weekend which really helped. When race day finally got here I heeded the advice I’d heard so much and saw in past race splits - “The race doesn’t start until Foresthill”- so I hadn’t pushed hard until that point and was both relieved and psyched to “unleash”! I didn’t realize for many miles that I had gotten in 1st place (with 30+ miles to go) by passing Bev at the FH aid station. Once having the taste of being in the lead and having Kami’s encouragement, I didn’t want to give it up! Was the race fairly consistent for you, or did you have some struggle spots? I loved the snow miles! I laughed out loud slipping around out there. The first 62 miles of the run were very fun, the last 40, much more work. I hit a low point a ½ hour or so out of Foresthill. I felt really tired and that I was working too hard, but when I looked at my HR monitor, it was only 124. Kami asked when I’d last eaten, and lack of food turned out to be the problem. I felt better after eating. I look forward to returning next year feeling better in this spot so I can really enjoy that wonderful downhill section all the way to the river crossing! How many events (and of what types) do you typically target in a year? What have been the highlights? I am in the process of figuring what the best number and combinations of events for me. Since January of this year I have run 15 ultras and raced 10 of them (50k, 40 miles, 50 miles, 100k, 100 miles). Part of the selection process this year was choosing at least 4 events so I could compete in the Montrail Ultra Cup -and choosing some big ones so I could honor my agreement as a member of the Montrail UltraRunning Team. 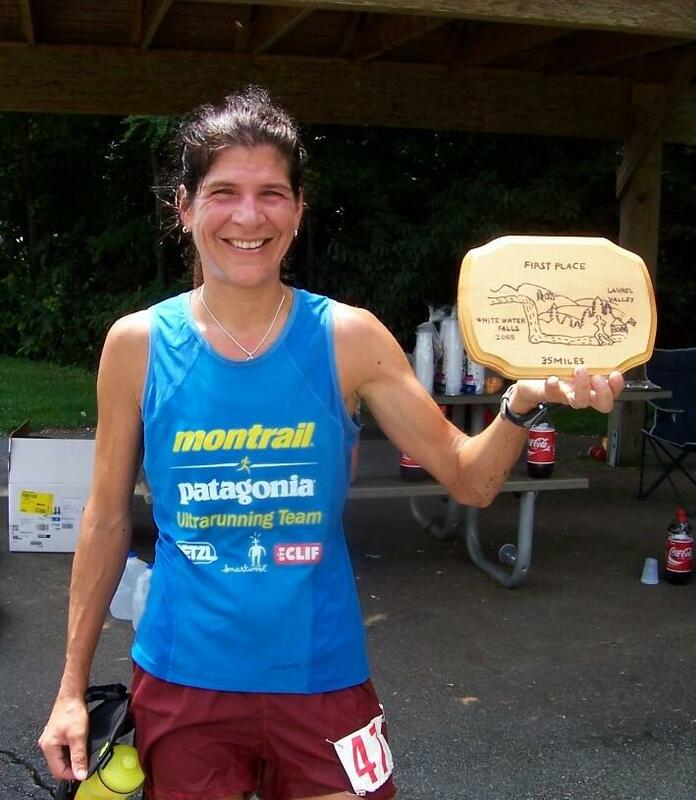 Some highpoints were being the first woman to break 7 hours at the Uwharrie 40 miler in February…this is a deceptively tough course and 100% rolling, rooty single track! Another high point was the Bull Run 50. I was fortunate enough to grab a new record on that one. Yet what made it significant was the lesson that presented itself during the race. It was 5 miles from the end of Bull Run 50 and I was going through a difficult spell when images of my Dad appeared. He’d been dealing with cancer for 7 years, but it recently had invaded his bones. It really hit me about how painful, frustrating, and scary it must be to be my Dad at this time, losing his strength, body and some independence. I knew without his usually strong body he was still Wes Bednosky, but the reliable tough vehicle of his body he’d inhabited for so many years was breaking down. I knew then that the discomfort I was feeling would soon end and I would recover. I knew I could choose the level of discomfort and with more practice, continue to push through discomfort and would heighten my threshold for what I was willing to deal with during training and racing. My choices as a runner were clear, my Dad’s choices seemed far less so. I celebrated having choices and being strong and healthy! Running to the end of Western States was an incredible experience. I felt like I was flying and floating all at the same time! Coming around the track and hearing my name and seeing my crew and thinking of home and family made it necessary to celebrate life and be grateful for a working body! I think my best race of the year though, was this past weekend at the Mountain Masochist. I came in 2nd to Anne Riddle Lundblat. The race was lots of work and Anne pushed me hard. I was overjoyed at sub 8 hours and having the both of us break the previous course record. If I want to keep doing this sort of running for any amount of time I have to cut down on the quantity of events. As I’ve learned to race harder and gotten more competitive I am finding that emotional/mental recovery is as important as physical. You mention the Montrail Ultra Cup. Can you tell us about that? The MUC is a combination of 12 diverse ultras of varying distances all over the US. It’s open to anyone. There are several divisions and ways to compete, but I chose to enter the “open overall”. This meant running at least one 50k, 50 miler, 100k and 100 miler. The Mountain Masochist was the “championship race” and allotted 50% more points than the others. I imagine MUC attracts many strong runners. What happened for you during the MUC this year? I got to run with some amazing women this year. Sadly, a couple strong women who were planning on competing were out with injuries. I had three really good finishes, placing 1st at Western States 100, Great Eastern 100k and at Ice Age 5Ok. I also came in 2nd at the Mountain Masochist 50miler. I had enough points to be the female overall open series winner-I found out last weekend, I am thrilled! You wear a Montrail/Patagonia jersey in the pictures I’ve seen. Are you sponsored by them? Yes! Since January this past year! I feel very proud and think it’s especially cool since I’ve been an avid fan of all our sponsors products for years, even before I knew about ultrarunning! I have a ton of VHTRC folks stopping by my blog. Do you run with this group regularly even though you are based in NC? I live less than 20 miles from the VA border so it makes sense for me to do long training runs and race in VA. I have run several VHTRC races and love the diversity of the group. They are a fun and supportive group of runners. When did you start trail running? Have you always been an athlete? To be honest, I started running trails because I didn’t have a flashlight or hiking boots! Right after college, in 1989, I worked in Yosemite Valley and during my days off I’d go on long solo hikes-I didn’t have boots so I always wore my sneakers. Often have 4-5 left of my 20+ mile day hike and it’d be getting dark-so I’d run back to the trailhead. I started running trails on purpose when I came to work at the North Carolina Outward Bound School in 1992, ran my first 40 mile ultra in February 2003,and my first marathon (trail) in March of 2004. Growing up I loved to play outside and run in the woods and climb trees, but I wasn’t an athlete. My twin sister, Cheryl, was a cross country and marathon runner and I was into theatre. We kept very tight to our chosen boundaries until we got away from each other and went to colleges 2,000 miles apart! I started running in college. What made you start running in college? I’d gained 20 pounds during my freshman year so I started running to lose weight. It wasn’t long before I discovered it also helped me relax and discover new places. Do you and Cheryl run together now? In spirit. Cheryl struggled with mental illness for years and took her own life in 1998. I miss her and know that both her and my Dad are somehow there beside me, willing me strength and perseverance when I get discouraged in training or during low points in races. I read that Kami Semick was your pacer for part of Western States. What section did she pace? Have you guys been running together for long? Kami was a GREAT PACER-fun, supportive, tough and strong. We ran together from Foresthill to the end. Neither she nor I had ever paced or used a pacer before, so we figured it out as we went along. I’d made some tentative plans with someone else for pacing earlier in the year, yet illness prevented him from following through. So with 3 weeks before the run, I posted a message to Montrail Team and Luanne Park responded and suggested I contact Kami. I’d read about Kami’s running accomplishments and was thrilled when she agreed to help me. We e-mailed each other a couple of times and talked on the phone 2x before meeting race day in Foresthill. I loved running as a “team” of 2 strong women! Hopefully I can return the favor some day. What inspires you to run? And keep up the training? I run because it is part of my life, like sleeping, eating and talking with the cat. If I can’t run, then I’m on my bike, hiking, or doing something! I train and stay inspired to do so, because I remember my goals - ones that I often say aloud in order to have others help keep my accountable. I love to race and without the training, racing would be less fun and freeing. Do some lessons of ultras apply to your job as a high school counselor? I think everything that happens on the trail happens in other parts of life. I keep most of my trophies/finishers medals in my office at the HS. When students show interest, I ask if they have questions. They are mostly interested in how a person eats and drinks and goes to the bathroom while running so long. If they ask, I tell. The uniqueness of it all makes for easy conversation, and that often opens the doors for more honesty with students and parents. And yes, metaphors abound! Sometimes I use these metaphors with my students, and right now I am trying to use it for my own motivation as I work on my application to become a National Board Certified School Counselor. It is a huge process requiring hundreds of hours of reflection, networking, work and documentation. My portfolio is due March 31. I keep telling myself to approach it as I am training for a 100 miler- can’t do it all at once, but in pieces you can do it - and like my training schedule, I have planned my timeline and “to do list” several months in advance. Do you ever do road races, triathlons, or other types of events? I have heard you have been known to put in some miles on the mountain bike. I have completed one triathlon, but because I am a pitiful swimmer, I am not pursuing them at the moment! I did my first adventure race two weeks before my first ultra and loved it (The North Georgia Adventure Race (NGAR)), which I’ve done the last 3 years. I dabble in mountain biking, road riding and cyclocross racing. The longest I’ve raced on pavement running was last December at a half marathon in Winston-Salem. I am slow at all things involving two wheels. Though I like to mountain bike, technical downhill scares me, and most of the time I will dismount and run with my bike on my shoulder rather than “ride”. What are some of your favorite races/locations? It’s tough to choose favorites as there are so many wonderful events. 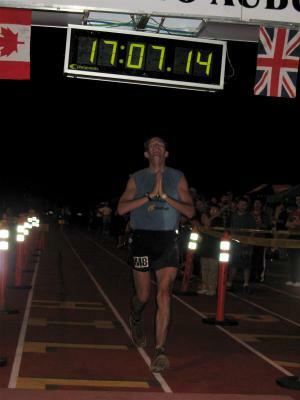 David Horton’s Hellgate 100k that started 2 years ago is high on the list. The race begins at 12:01 am the 2nd Saturday of December. The first year we had a full moon, no wind, cold temperatures and several inches of snow on the ground. 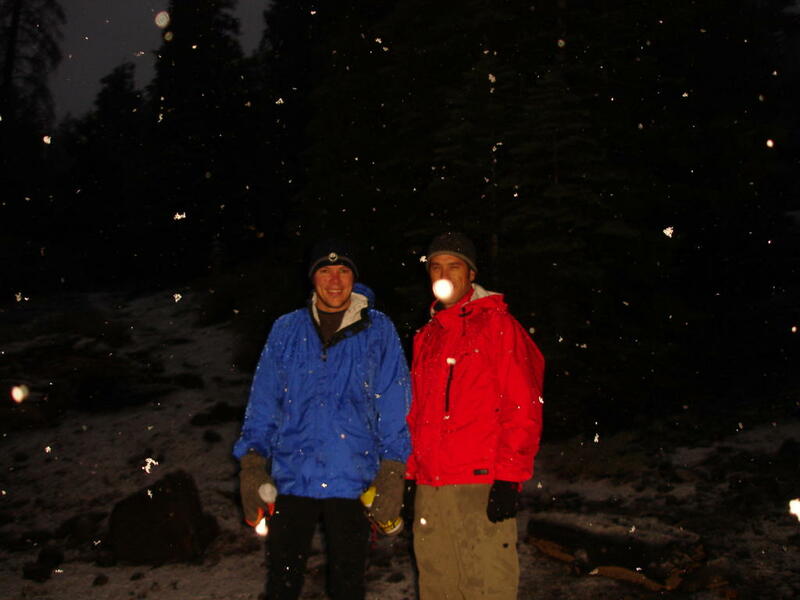 The reflective snow made headlamps unnecessary most the night. It was truly a magical time. I encourage my running friends who are considering 100 milers and who haven’t run at night to come check out this event. It’s a great opportunity for learning as well as a top-notch race. I really enjoyed WS100 with the exquisite scenery and helpful volunteers and White River for the same reasons. I could go on and on. Lastly, a few training questions. What’s a typical training week look like for you? How many miles? When do you add in speed work? The amount of miles change with what I am working towards. This year, during April and May, I would run 80-100+ mile weeks for 3 weeks, back off several days prior to a race (50M or 50k), recover with low mileage for a few days and jump back with bigger mileage. Usually I have 2-3 hard workouts a week. I have had fun this fall doing hard workouts 1x-2x a week with our high school cross country team. Participating in local 5k or 10k fundraiser runs are hard workouts too. What are your favorite foods/race snacks? I have discovered gel this year…I also like Clif Bars, PB&J and salted potatoes. What is your diet when you are not involved in a race? I am an Atkins rebel. I love bagels, pasta, all veggies, sugar, atomic fireballs, lean chicken, coffee, and red wine. Aside from cycling, do you cross-train at all in other sports? I really like to snowboard and rock climb, but I don’t regularly do much besides running or bike riding-except to workout on a cross trainer if it’s too icy or snowy or I’m feeling whimpy. I’d like to, but there isn’t enough time for everything! A lot of the blog readers love to hear about “lessons learned” (ie, things that didn’t go right that perhaps they could avoid). Any you would like to pass on? - risk being seen as anti-social and spend a quiet night by myself before races. Any tips you would like to pass on to somebody trying their first ultra? How about a first 100-miler? How about their first Western States. I would encourage that person to enjoy their preparation and choose goals for themselves that their lifestyle will support them reaching. Be sure there aren’t other significant life events that will be hugely distracting during the building phase. Last year one of my friends was in the midst of helping her daughter plan for a wedding that took place 2 weeks before her first 100 miler. At times she was very distracted from running and often had to back out of some of her long runs due to the obligations and stress of the wedding. For me, making a master schedule of a training plan, work and home obligations and special occasions months in advance help me with successful preparation. Also, besides getting time on feet, I would encourage that person to discover what they can about the course and prepare in similar conditions/terrain and to study a map and look over past finishing times and splits if available. Prepare for rain, sleet, heat, humidity, night running etc… I loved the preparation phase of my first 100 miler, The Massanutten in VA. I read dozens of race reports and studied split charts and ran the whole course in pieces during the months preceding the race. My approach to Western States was similar. Training terrain specific by running lots of horse trails here in the east and downhills helped prepare my quads. I wore extra clothes for long runs and experimented with different electrolytes to prepare for the anticipated heat. The best preparation for my brain was attending the 3-day training camp hosted by race management over Memorial Day Weekend. We got to run almost 70 miles of the course. I arrived in CA 4 days before WS to explore and camp and recon other 25 miles of the course. This helped me know what to expect. I also paid special attention to the terrain after mile 80, knowing this could be a difficult section. Mostly, though, I just celebrated being able to run in one of the most beautiful places in the US! What’s next on the race/run agenda? Any plans for ’06? At the moment I am in the 2nd week of a self-imposed 2 months off from serious training during which time I’ll run less and participate in a couple of local non-ultra events. I plan to go to a “new” place in January to Huntsville, Alabama for the Mountain Mist 50k. Other plans for ’06 include Western States, and at least 4 of the Montrail Ultra Cup Races. Thank you for your interest and for listening to my rambles! Thanks to everyone for your feedback on the Mountain Hardwear© iPod T-shirt and Montrail© Ankle Brush Guards product ideas. If you have designs of your own, let me know how to link to them! Here's one more product idea specifically for the dudes out there. I'm a big fan of Injinji© Tetratsoks (or "tsoks" as they are called), the trail running socks that fit your toes like a glove. Once I switched to them, the chafing and blistering of my toes disappeared altogether. So how could this technology be applied to another area of chafing that for many men can be, uh, troublesome? Product Idea - The Injinji© "Nut-Tsak"
Taking a cue from the independent sleeve design of the Injinji tsoks, the Nut-Tsak 3-pocket design protects the family jewels from any unwanted chafing. Similar use of advanced, breathable fabrics like CoolMax and Lycra make the solution wickable and all-season. David demonstrates below. BTW, you can buy Injinji tsoks (not tsaks) at REI.com, and learn more about them here. Last weekend, Dean Karnazes achieved the impossible by running 350 miles non-stop (that's right.....350 MILES!) as a fundraising effort for Organs 'R' Us (you can read the Outside Magazine article here). I had a chance to catch up with Dean and here a bit more about the run, and his continuing efforts to raise funds to help Katalina, a one year old girl in need of a heart transplant. Donations are still being accepted here. 1) First, congratulations on an amazing run! Are you insanely sore right now? Surprisingly, I’m still on a high and not all that sore. I think the soreness won’t kick-in for a week or two. 2) What was the course you ran? Why did you choose that particular course? I ran 151 miles to the start of The Relay, which is a 199-mile relay race that I ran solo. I wanted to run through Bodega Bay to visit the Nicholas Green Memorial. Nicholas was the little boy who died while on vacation in Italy and donated his organs to seven Italians. The Relay is a benefit for childhood organ donation, and my run was structured as a fundraiser for a little girl at Stanford Children’s Hospital who has a failing heart. So the course seemed fitting. I placed a card and flowers from my family at the Nicholas Green Memorial when I got there. From Bodega Bay I ran north through Healdsburg and then down to Calistoga where The Relay begins. 3) It sounds like the weather cooperated a bit more this year than your 262-mile run last year. How were the conditions for this run? It didn’t rain for days like last year, but it got pretty hot. During two of the days temperatures were in the 90’s, which was kind of a bummer. The heat took a lot out of me. 4) You added over 80 miles to your run from last year, requiring three days/nights of running. What were the major obstacles in going this distance? Sleep deprivation was a major challenge, as was the sheer number of miles. There’s a definite tradeoff between speed and wanting to conserve your strength. You want to run fast to get it over with quicker and not have to endure additional hours without sleep, but running faster takes more out of you. So you try to find a balance. I was logging 175 mile training weeks leading up to the event and doing lots of night running to prepare, getting up at 2:00 AM on work days and running for five hours before taking the kids to school and heading to the office. I’ve never trained so hard in my life. I felt like if I ran another mile further I’d get injured or sick. My goal going into it was to be in the best shape of my life. 5) What did you eat/drink and how many calories did you burn? Any pizzas or whole cheesecakes on this run? My crew calculated that I ate something like 40,000 calories and drank nine gallons of liquid over the course of 80 hours and 44 minutes of running. I basically followed a seafood diet; I saw food and I ate it. Choices ranged from energy bars to almond butter sandwiches and just about everything in between. My crew was really dialed-in this time. They were in a motor home following alongside me, and we really worked efficiently as a team. Having such terrific support was critical. 6) Can you walk (I mean, run) us through the experience? What were the highpoints/lowpoints? The first two nights of running went as well as can be expected. Nothing too crazy. But that third night without sleep got fairly psychotic. I started swerving and veering across the road, which got pretty scary. The last ten miles were as close to an out-of-body experience as anything I’ve ever experienced before. My mind seemed disassociated from my body, and I just floated along. There was no sensation of pain, no feeling at all really, just floating. Weird. It was late and it was a beautiful cloudless night, the moon was full, stars were shooting; the whole thing was all very surreal. 7) How do your feet feel? Any blisters? Did they swell much? I went through four pairs of shoes. Started with a 10, changed to a 10 wide, then to a 10 double wide, and finished with a 10 4x wide. So there definitely was some swelling, but surprisingly no problems with blisters. I lost a few toenails, which was kind of brutal. 8) You have said that you think 500 miles nonstop is achievable. Do you still believe that? (Laughs) It’s difficult for me to get my head around 500 miles right now. Maybe on a flatter course, or on a track, in cooler conditions it could be done. Running over hills and through the mountains like I did during the 350 was not conducive to sheer miles, but it was the course The Relay follows. I’m not saying that 500 miles is undoable, it just might take a better runner than me to pull it off. 9) You ran to help build awareness for Organs ‘R’ Us, who assists people needing organ transplants. This run was specifically to help Katalina, a young girl who needs a transplant very soon. Can you tell us more? Katalina has a failing heart and is in desperate need. I structured this run as a fundraiser to support her. I solicited per mile donations so that the further I made it, the more I raised for her. During the low points, the times when I wanted to stop, I kept reminding myself that if I stopped short of my goal of running 350 miles, Katalina would receive less. My pain, I told myself, was nowhere close to the pain Katalina and her family are enduring. So I kept going, wouldn’t let myself stop. People were incredibly generous in their contributions. The North Face pledged $10 per mile, and many individuals contributed. It was quite extraordinary how supportive people were, and continue to be. 10) Can people still donate to help Katalina? Yes. The contributions continue to come in and are welcomed. It’s getting down to a sprint now, every day matters. We need to save this young child. She is going to be a runner. I just know it. Thanks Dean, and good luck on your recovery! For those interested in hearing more from Dean, be sure to check out our original interview, and his discussion about his goal of running 500 miles. 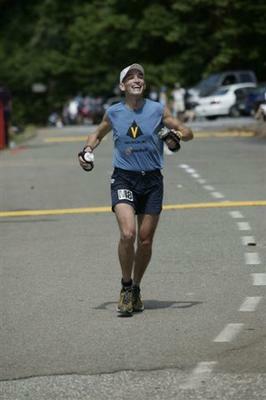 Dr. Marty Hoffman is currently a top contender in the 2005 Fuel Belt Ultrarunner.net Series, and has been a regular ultra runner for many years. If Marty is in an ultra, you can expect he will be placing in the top 10, such as his recent finishes in the Tahoe Rim Trail 50 mile/RRCA National Championships (8th), Run On The Sly 50k (1st), or his 1998 2nd overall/1st male at the Kettle Moraine 100-miler. He’s a great guy to pace with too – as a teaching physician specializing in physical medicine and rehabilitation, he knows all about how the body reacts to the stresses of endurance sports. He’s a natural teacher, so he’s happy to share tips and communicate in a way that even a half-bonked ultra runner like me can understand. I caught up with Marty after his win at the Run On The Sly 50k, as he faces the last two races in the Fuel Best Ultrarunner.net Series. First, congratulations on a great season! Your finishes in the ultrarunner.net series have been consistently at the top. How many races do you have left in the series? Thanks. It’s been fun getting back into trail racing after not doing so much for a few years. At this point, there are only a couple more races in the series – Lake of the Sky and Helen Klein. I plan to do Helen Klein. I will miss Lake of the Sky this year because I know better than to think that I can be adequately recovered to run my best within three weeks of running the Rio Del Lago 100. What are your chances on winning the whole she-bang? Is there anyone in your rear-view mirror? At the moment, I’m on top with the points from Rio Del Lago, but there very well may be some shifting of positions before the series is over. In this sort of thing, it’s not necessarily the best runner who takes the prize. It mostly depends on who gets in enough of the right races and runs reasonably well. If I end up winning, it’s not because I’m the best runner in the series. Like most kids in the 60’s and early 70’s, I was into team sports. But, after getting tired of that mentality and being cut from the high school baseball team, I started running as a junior in high school. That’s also when I became an athlete. 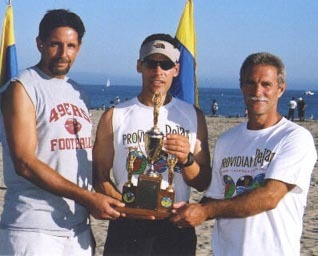 I was most fortunate to have a great high school coach who set the foundation for making running part of my lifestyle. I competed in track and cross-country through college, and also started running marathons during that time period. My first ultra was in 1985 when I was 29 – the American Medical Joggers Association 50 mile in Chicago. The race was held on a flat 5 mile stretch of asphalt along the lake front. I recall, after comfortably coming through the marathon in under 3 hours, I proceeded to learn how tight ones hamstrings can get – a painful lesson that day, but it got me hooked on the challenges of ultrarunning. It also got me looking for trail ultras, and that’s when I started running the Ice Age 50. But, about the same time, I was getting serious about cross-country ski racing, and running just became part of my training for skiing. I continued to focus on cross-country skiing until about 1996 after a few top-200 finishes in the American Birkebeiner. But, as time became more precious, the focus went back to running, and I ran my first 100 miler at the inaugural Kettle Moraine 100 in 1996. You’re a PM&R doctor and your research relates to exercise, correct? 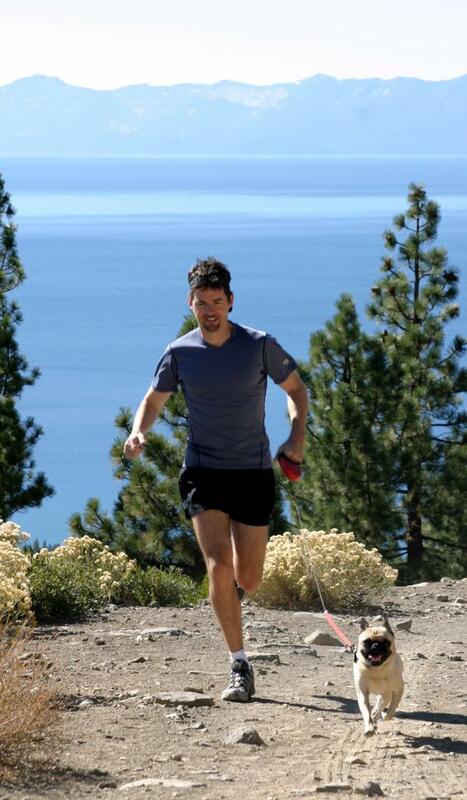 Has this helped you become a better trail runner? Most of my research falls within the umbrella of applied exercise physiology. Much of this work has focused on factors affecting the economy of human movement. For several years, we did a lot of research on cross-country skiing and the ski skating techniques that were new to the sport. More recently, much of my research has been related to the effects of exercise on pain perception. Our work has demonstrated that pain perception can be transiently decreased after a 20-30 minute bout of exercise in healthy people, as well as individuals with chronic low back pain. Wondering what might happen with an extreme amount of exercise, we measured pain perception at the 2005 Western States 100. Since these results haven’t been published yet, you’ll have to stay tuned to hear the findings. Clinically, I’ve mostly worked in the areas of cardiac rehabilitation and musculoskeletal medicine. Initially, I largely did sports medicine, and worked for several years with the US Biathlon team as a team physician and researcher. Over the past decade, I’ve been treating folks with a wide spectrum of musculoskeletal disorders, including chronic pain. Given this medical and exercise science background, it’s likely that non-runners would think that I should know better than to run so much! Actually, the knowledge probably has paid off some and helps me make up for what I lack in genetics. It has likely helped some in the sense that I have a good understanding of what it takes to physically prepare for the demands of the sport, and how to avoid and treat injuries. I might also be a little more protected from some of the vulnerabilities athletes might have to various unfounded products and training techniques that get promoted. What do your students think of your ultrarunning? Is your family supportive as well? I’ve probably been fortunate that the students and residents have generally been kind enough to not tell me what they think. I do know that they don’t always appreciate me making them take the stairs when we’re making rounds in the hospital! But hopefully, they don’t look at me as being so off the wall that I don’t make at least a bit of a positive impact. As for my family, they’ve been very supportive. Although, they may not fully understand why I do this, it’s evident that they are more likely to admire me for what I do than think I need to be committed. They had their first practice crewing this year at Rio Del Lago and had a great time, managed not to get lost, and didn’t feel too sorry for me. In fact, I think my sons really had fun pacing me a few miles and actually enjoyed seeing me suffer! Well that’s the million dollar question! If we could answer that, and bottle a bit of it for the majority of our population that doesn’t exercise and is over weight, then we would really make an impact. The truth is, after over 33 years of running, I still have difficulty articulating the answer to the “why” question. So I guess it shouldn’t be a surprise that those who don’t do this, can’t fully understand its value. In my case, I see the driving force for performing regular exercise as different from that for preparing for competition. Simply put, my motivation for regular exercise is inherent - exercise is fun, it feels good and I know it’s healthy. In contrast, training to compete goes beyond health, and is not always the most healthy behavior. To optimize performance, you need to be close to the edge, and sometimes you end up going over. In my younger days, the driving force to train at that level mostly related to external rewards of recognition (what little there was!). But over time, the drive has come more from the internal sense of success that I just can’t experience in any grander manner than from a challenge that offers plenty of opportunity for failure. The hard training is also about the continued pursuit of those days when everything just falls in place and you’re flying effortlessly down the trail. I must say that I still find it intriguing to see what the human body can do. I enjoy being around people performing such amazing things, and experiencing some of that myself. Your 50k and 50-mile performances are outstanding. Have you done 100-mile events since Kettle Moraine? How about shorter events, like ½ marathons? Well thanks Scott! Since the 1998 KM100, I actually took a hiatus from any real focus on competition until just recently. The loss of my first wife to a long battle with breast cancer, combined with a young family put any interest in serious competition on the back burner. Although I continued to run the Ice Age 50 each year (my home course at the time), running became my way of maintaining mental and physical health. I learned just how important regular exercise can be when going through stressful times. As a single parent trying to maintain an active professional career, I also recognized that most of the excuses I hear from people claiming they don’t have enough time to exercise aren’t very credible! Do you train with a running club, or have a group of other ultrarunners you train with? These days, a lot of my training is with my wife. I got her running in 2000, shortly after we met. She’s a naturally gifted runner, but somewhat to my dismay, seems to have no interest in putting her natural talents into a competitive situation. Nonetheless, she’s a great training partner and it’s wonderful to have this time together. Since she prefers running in the morning when she’s still half asleep, and that’s my worst time of the day to run, she gives me a decent workout most weekdays. I generally get in a long run on the weekend. There’s a great group of folks (the Trail People) who I used to sometimes connect with for long runs while I was still living in the Milwaukee area. And there’s quite a network of great people in Northern California that I’m now beginning to connect with. Due to other demands, I’m not able to get in quite as much training as I would like, but things are much better in that regard than in the past. My usual “baseline” training week currently consists of seven miles most weekday mornings, an extra seven one weekday evening, and a trail run of around 25-35 on the weekend. I’ll bump that up with an extra run of around 15 miles during the week when preparing for a longer race. I’ll add a little speed play when training for an event that might require a faster than usual pace, but avoid doing anything too structured. I also try to do a little trunk and leg strengthening work a couple times per week. I’ve learned that I have to be a little more careful about what I eat than some folks. This became clear in college when I recognized that I was better off sleeping in than getting up and eating breakfast before a Saturday morning cross-country race. Of course, the coach thought I was just lazy, but I knew my GI system wouldn’t rebel if my stomach was empty. However, getting through an ultramarathon requires the intake of some fluid and calories along the way. After a couple bad experiences this year, I’ve finally learned to stay away from fructose, and seem to do best with water and gels that include a little protein. This will generally get me through races up to 50 miles. Beyond that distance, I typically have challenges with nausea, and nothing that is at all sweet is tolerable. That’s when I end up resorting mostly to things like pretzels, soup and peanut butter sandwiches. Obviously, I’m still figuring this out since the nausea was a serious issue for me at Rio Del Lago this year where I was down 12 pounds at the finish because of difficulty forcing down anything in the last half of the race. 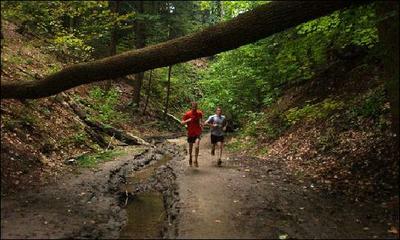 Do you cross-train at all in other sports, or stay specific to trail running? Well, if wine tasting doesn’t count, then running is about all I’m doing right now! After a decade of competitive cross-country skiing, I haven’t been on cross-country skis since the last race I did, which was in France in 1998. I’ve intermittently trained at sea kayaking over the past 20 years, and when we first moved to northern California about two years ago, I had done a couple kayak races before my first running race. But, with the focus on running, there’s not been enough time to continue kayaking either. Certainly, I’d be healthier overall by including some skiing or kayaking in my program, but doing your best to get ready to race is not just about being healthy. One thing I recall from my early days of ultra running was the leg pain, especially affecting the quadriceps and hip flexors. Over years of running long distances, the muscles adapt to tolerate the eccentric (lengthening) contractions they experience while running. At some point, the limiting factor then relates to energy availability rather than leg pain. When my performance was still limited by leg pain, I experimented with non-steroidal anti-inflammatory medications. But, after producing bloody urine for nearly the last 50 miles of a 100 miler, I became much more cautious about the use of these medications. At this point, I wouldn’t recommend taking such medications since they reduce kidney blood flow in a situation where there is already the potential for a significant compromise in blood flow to this organ due to dehydration. It’s my opinion that if you need something for pain, acetaminophen is a better option. Another thing I’ve learned is the value of having a good pacer in a 100 miler. I’ve run 100’s with and without a pacer. It can certainly be an interesting experience going the distance alone. But, if running your best time is your goal, then you should have a pacer who understands the needs in such an event and can take good care of you but will also continue to push you. Your “on the fly tips” that you gave to me at the Rucky Chucky 50k (my second ultra) were really helpful. Any tips you would like to pass on to somebody trying their first ultra? Well, I’m glad that helped, and that you didn’t end up landing flat on your face as a result of my advice. I really don’t have anything too enlightening for the newcomer to the sport. But, I would certainly recommend continuing to ask your fellow runners how they deal with the issues you may be concerned about. I’m still asking questions. And as a group, ultra runners are the most supportive bunch I’ve ever associated with. Also, during the race, remember to hang in there when things seem to be getting tough. It’s often hard to imagine, but things really can get better after going pretty sour, if you just hang in there…not so different from life itself, sometimes! What’s next on the race/run agenda? 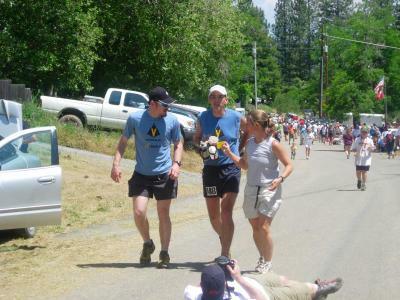 I’m sure hoping that the 2006 Western States is the next big race. I have to get in next year if there’s any hope of running 20 of them by the time I’m 70! He did it!!! Dean "Karno" Karnazes added a 151-mile warm up to the 199-mile "The Relay" to complete a hilly, three day 350-mile ultra run. Dean is THE MAN. Note that donations are still being accepted in case you would like to help out. You can also check out my previous interviews with him about his accomplishments and training, and his goal to run 500 miles nonstop. October 18, 2005 On Wednesday, October 12, at 2 p.m., ultrarunner Dean Karnazes went for a run. At 10:44 p.m. on Saturday, October 15, 80 hours and 44 minutes later, he had covered 350 miles in a nonstop, sleepless loop through the San Francisco Bay Area. Karnazes’ run is part of his fundraising effort to collect donations totaling $10,000 for two-year-old Katalina Thang, a little girl with a congenital heart defect who is awaiting a heart transplant at Stanford Children’s Hospital. “One of the motivations was to experience the lows of a selfish runner dude, and realize that my pain was so much less than Katalina’s,” Karnazes told Outside Online. His route included San Francisco’s 199-mile relay race, known as The Relay, an annual benefit for children’s organ donation. But, true to form, the semi-celebrity author of Ultramarathon Man: Confessions of an All-Night Runner upped the masochistic ante. He ran 151 miles to get to the start of the relay, which he then ran by himself. Karnazes is getting closer to his goal. While most donations have come from individuals, corporations have also contributed to the cause. The North Face pledged $10 for each mile he ran for a total of $3,500. And donations are still rolling in. Most of Karnazes’ long runs—he has completed dozens over 100 miles—have been structured as fundraisers. He has raised money for the Special Olympics, the Leukemia Society, and The Challenged Athlete Foundation, among other charities. This time around, he endured temperatures in the 90s that “fried me a bit,” extreme sleep deprivation, and the occasional scare from roadside creatures. In order to survive the 350-mile gauntlet, Karnazes had to ingest abnormal quantities of food and drink. “I ate 40,000 calories and drank nine gallons of liquid during the run. That’s what a normal person eats in about three weeks,” he said. In addition to raising money for Thang, running 350 miles was something of a test for Karnazes, who plans to attempt an even longer feat in the future. To learn more about Dean Karnazes, Pam Reed, and other ultrarunners, read “Desperate Housewife Stalks Male Supermodel in Sports Death March” from this month’s issue of Outside. There were a lot of nervous faces this morning at the Lake of the Sky 33 Miler in Tahoe City, CA, as the first snow of the Lake Tahoe region began coming down just an hour before the 7am race start. Robert Mathis, the Race Director (RD), had a tough call to make - was this just a morning sprinkle that would pass, or was he going to have to cancel the race? The snow was a surprise to everyone. 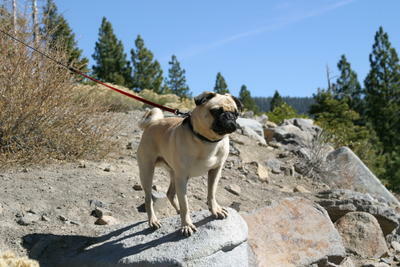 Just two days before, Rocky and I had scoped out part of the course (see pic) and it was 70 degrees and sunny. But this time of year, anything can happen at 7000' feet. I had run into Craig, one of the race volunteers marking the trail, and he mentioned there was a slight chance of snow. We talked briefly about how that can make marking a trail difficult, but can also be a lot of fun if the snow wasn't falling too heavy. This particular section of the Tahoe Rim Trail had some exposed shale hills that were tough to navigate even without the snow. If there was snow and wind, it was going to be a tough call. The morning of the race, the snow was coming down quickly (about 3" an hour). Christi, Rocky, and I drove to the race start packed with all my winter supplies (I had remembered from Rucky Chucky to always bring too much stuff rather than be cold or wet). When we checked in, they let us know the race had been canceled. The aid station volunteers (a few of them race directors themselves) were reporting near-white-out conditions and 20-30 mph winds. There was high risk of getting lost, meaning increased odds of hypothermia as well. This was not a morning to race. As I spoke with Robert, I began to understand how tough it is for an RD to cancel a race. He and his crew had already put in hundreds of hours, and everything was in place. The entry fees were already applied to needed expenses such as permits, insurance, supplies, etc., so he couldn't start handing out refunds. And this was the second-to-last race in the successful Ultrarunner.net Series, so any cancellation would have a lot of questions. Robert knew as much as anyone the training and travel required by the runners and volunteers alike. Canceling a race is never an easy decision. But Robert made the right call and canceled the race. RD's put safety first, and this race was posing too much risk. Many racers agreed that it was the right move, and came up to him to say thanks for making a tough decision. But a canceled race is not enough to discourage this crowd - they just dug into the delicious carrot cake, got to know each other, and hoped the afternoon sun would melt enough snow for an afternoon group run. I snapped a pic with Shane and Derrick and headed back to the Tahoe condo to do a training run in the snow in a more wind-protected area. I took it slow, enjoying the quiet of Tahoe's first snow. The clouds parted later in the day, and after two hours of slush, the trails were clear again. I was thankful that Robert was looking out for us, and look forward to trying again next year. And if I know Robert and the Tahoe Mountain Milers, they are probably already filing the permits. Andy Jones-Wilkins is a school principal by day, but put him in a pair of trail running shoes and he will show you a talent for ultrarunning that few can match. 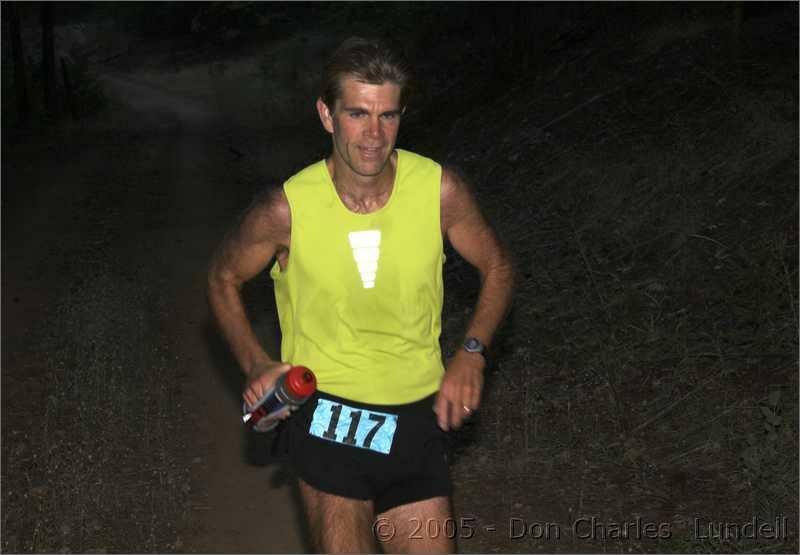 His ultra performances have improved over the years to world class finishes in 2004-05, including a 2nd place overall against a challenging field at the Western States 100, 2nd overall at the Angeles Crest 100, 2nd overall at the 2005 Rocky Raccoon 100, and 1st overall at the Wheres Waldo 100k. If he isn't racing, he is probably pacing for the likes of Vasque team member Rob Edde, friend Joe Kulak, or just out doing some insane mileage in the heat he loves. I caught up with Andy in between the Angeles Crest 100 and the Quad Dipsea to comment on his season to date. First, congratulations on an amazing ‘05 season! Your 17:07 2nd place finish at Western States is one for the record books. Was that your peak race? Absolutely! My entire year was geared toward Western States. I spent hours in the canyons and dragged myself to the track for 8 weeks. Since Western States I have basically been running on fumes although I am itching to begin ramping things up next month. I like an 8 month lead up to a bit 100 miler. Did you change anything about your training in the last year to get these great performances? Yes, I actually made three significant changes to my changes in 2005: First, I traveled to the race course 5 times during the three month period leading up to the race. I ran specific sections of the course aiming at certain split times and I practiced my nutrition and heat plan on those runs. Second, as I said earlier, I made a point of getting to the track once a week for hard speed sessions. Basically, I stuck with 8x800 in 2:40 with 2 minutes rest. This built up my turnover for the "runnable" sections of WS and kept me from getting to "power-oriented" as a result of all the hills I was doing. Third, I built up my weekly mileage to 130 miles per week without getting injured. This volume gave me expanded capacity and actually made 50 mile training runs seem short (I can't believe it but it's true). I started running trails when I moved to Arizona from Philadelphia in 1996 and did my first ultra in 1997. I jumped into 100 milers in 2000 and I have now completed 10. That is definitely my preferred distance. I played soccer, basketball and lacrosse in High School and then transitioned to golf and beer drinking in college. I actually became interested in ultrarunning after completing a series of cross country bicycle tours with my wife. I needed to do something in the winter to keep me in shape. Now, my bike is gathering dust in my garage and I go through a pair of running shoes every month. Funny how that happens. You are a principal, correct? What school? What do the kids think of their ultra-principal? I am a middle school principal at the Head-Royce School in Oakland, CA. It's a great job for an ultrarunner because it's so intense and people centered. The kids here at school really respect the fact that I do what I do and the cross country team, in particular, is psyched that I am "one of them." I think the thing that the kids think is really cool is all the stuff I get from Vasque and my other sponsors. It's not exactly a Tiger Woods type deal but I think they like to think their principal has "another" life. What does your family think? I hear you have three kids famous for stealing your snacks. My races are definitely family events and everybody has a prescribed role. My wife Shelly is my coach and psychologist and keeps my training focused. My oldest son Carson (7) is responsible for fluids, my middle son Logan (5) is responsible for gels, and my youngest son Tully (2) takes care of electrolyte tablets. And, you are correct, on more than one occasion I have caught the boys out in the garage eating my energy gels. What inspires you to keep up the training? I am inspired by a love of the trails and a passion for pushing myself hard. The competitive side of ultrarunning is certainly a motivator but truly the training and the hard work are what keep me going. I just love being out on the trail, far away from everything. It breaks down life to its core values and all else goes away. To me, it's intoxicating. Do you have regular crew and pacers, or do they change from event to event? My crew is my family. Without them I would not have enjoyed the success I have enjoyed. My wife Shelly knows just when to push and just when to lay off and knowing that my kids will be waiting for me at the finish line always puts a bit of spring in my step. At the risk of offending anyone I will say that I have enjoyed all of my pacers. Obviously, the pacer/runner relationship is a complex one and there are subtle nuances that must be acknowledged. I will say that the pacer combo of Andy Roth and Craig Thornley was just about perfect at Angeles Crest this year. I am part of the Vasque Ultrarunning Team and they are my running family. But, as far as training partners, I like running solo. I do hook up with folks for the big runs on the Western States course and I have had a blast up there with Craig Thornley, John Ticer, Jeff Riley, Ed Willson, Tom Lyons, Mark Richtman, and Tim Fitzpatrick. I have also been inspired by my ultrarunning mentor Tom Nielsen who I don't train with often but his words continue to guide my racing. By and large, however, I train long and solo. Western States and Angeles Crest are my favorites and I also like Miwok and Where's Waldo. Over the past year I have become more intrigued with the Big Mountain venues and I am hoping to get out to Wasatch, Leadville, Hardrock and a few others over the next few years. Lastly, a few training questions. Whats a typical training week look like for you? How many miles? When do you add in speed work? I run 100 miles a week year round and try to peak at 130 a month before a big race. 80% of my running is on trails with the remainder on the roads leading to the trails and the track. I try to get to the track for 8 weeks leading up to a big 100 in order to get my turnover going. Much more than that drives me crazy. I try to balance protein and carbs throughout a long race and as such I try to eat a diverse selection of food. I start out with turkey and avocado sandwiches early in a race and switch to soup later. I try not to push gels until that last 5 hours because once I start I can't stop. I am OK with just about any drink mix and I do drink a lot (80-100 ounces and hour depending on heat). My favorite post-race meal is a burger with fries and a cold Sierra Nevada. A lot of the blog readers love to hear about lessons learned (ie, things that didn’t go right that perhaps they could avoid). Any you would like to pass on? Well, I ended up in the hospital with Acute Renal Failure following the 2004 Angeles Crest so I would definitely urge people to listen to their bodies and try not to run outside of their abilities. Obviously, fluid and food are key but the mental aspect that comes into play during the second half of a 100 mile race cannot be overlooked. The truth is that just when you are becoming stupid is when you most need to be smart. It's a fine balance but one that the most successful runners understand. Obviously, I am still learning. Any tips you would like to pass on to somebody trying their first ultra? Train smart but hard. Use races to build up for your big events. Stay in control of those things you can control. Accept that things will go wrong. Run the downhills as fast as you can. Lose weight so the uphills are easier. Be physically strong and mentally stronger. Whats next on the race/run agenda? Do you plan on doing more/less races next year, or try different races? After Quad Dipsea in November I will chill out until Rocky Raccoon in February. Then I will build up with Way Too Cool in March and Miwok 100K in May. That will all be to build up for WS 2006. I'd like to run the best race of my life out there next year. It won't be easy. I hope it's hot. 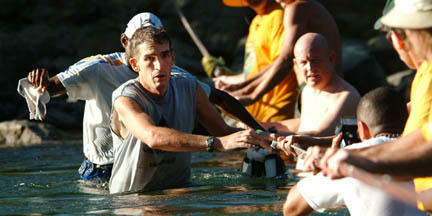 A great article about the escapism of trail running by Gary Fallesen. This one takes place near Rochester, NY. (September 29, 2005) — Alan Hatch started running and didn't want to stop. So he kept going. And going. "It was supposed to be one hour," he says, recalling a trail run he made in Mendon Ponds Park soon after moving to the Rochester area five years ago. "Well, some three hours later I finally made it back to where I had parked my car — and without running on the same trail twice." Hatch didn't get lost. But he did lose himself in the moments. Trail running will do that to you. The deeper you travel into nature, the farther you want to run away from the rest of the world. It keeps you going. Gae Orsini will attest to that. She'd heard trail maven Mort Nace talk about trail running and say the "roads are poison," but she admits: "I never really grasped the meaning of that when roads were the only terrain I knew." That was until she went off-road a few years ago. "Now I consistently run — and ride — off-road," says Orsini, 38, of Mendon. "I'm very hooked and have little desire to return to the exhaust, the muffler noises and the dangers associated with sharing the road with automobiles. I prefer the easy access to nature and the soft ground, which has kept me injury-free for the past two years." Orsini says she'd rather risk tripping over a tree root than "becoming someone's messy hood ornament." Dennis Vankerkhove, 45, of Rochester, spends about half of his running time off-road. "I enjoy hiking and running, so trail running is a good mix of both," says Vankerkhove, who also runs with the Genesee Valley Harriers. "Running on trails (is) much more interesting than the roads and (has) less impact on my legs. Trail running seems less competitive and most of time I am by myself in the woods." Not that trail running has to be about solitude and oneness with nature. Vankerkhove was part of a team that finished fourth out of 350 teams at the annual Dances With Dirt 100-kilometer relay Sept. 10 in Hell, Mich. His running mates included Linda Grossman, Ian Webber and Greg Crego of the Rochester area and Al Evans of Corning. Two other Rochester teams finished 20th and 21st, respectively. Autumn is peak season for trail racing in the Rochester area with the inaugural Out of Bounds Half Marathon Trail Run on Saturday at Bristol Mountain; the 13th annual Ridgewalk & Run on Oct. 16 in Wellsville, Allegany County; and the 12th annual Mendon Trail Run on Nov. 5 in Mendon Ponds Park. There's also the Rochester Autumn Classic Duathlon, a run-bike-run-bike-run Sunday at Mendon Ponds Park, and the first-year Black Diamond Off-Road Duathlon on Oct. 21 in Victor. Hatch is doing the Autumn Classic, which precludes him from going to Out of Bounds. However, Orsini is hoping to do the half-marathon. The Out of Bounds is being organized by Nace and Tim Ratkowski, directors of the grueling and popular Muddy Sneaker 20K Trail Run in Naples every April. "I downhill and telemark (ski) at Bristol during the winter and it will be fun to see the mountain from a different perspective," Orsini says. Hatch and Orsini both did the 14-mile trail run at last year's Ridgewalk. "It's a race that's often mentioned in the same sentence as the Muddy Sneaker in terms of scenery and pure difficulty," says Hatch, 30, of Pittsford, who was third among Ridgewalk runners in 2004. "Needless to say, it didn't leave me disappointed in either category." Hatch enjoys mixing up his training regimen, which includes biking and snowshoe running. "I always try to hit the trails once or twice a week as a planned or unplanned workout," he says. "It really helps to keep your training interesting and fun, which in turn keeps you coming back for more. "Each year I try to find at least one new trail race to do, and this year it was the YellowJacket PowerBar 9.5-mile Trail Race in Mendon Ponds Park. You would think that after all of the running that I've done in the park that I've run on a majority of the trails. But to my surprise that just simply wasn't the case." Hatch found new trails to keep his interest. New trails with bends he hasn't been around and scenery he hasn't seen. "I think it takes a certain type of individual to run or race on trails," Hatch says. "You have to be light and nimble on your feet and take what the trail gives you because you never know what lies around the corner." That's part of what keeps a trail runner going. And going. As I mentioned last week, I’ve found a great way to get in some good “long and slow mileage” on the trails without getting bored. Volunteer for a race! They always need folks to help mark trails and clean up at the end (ie, “long and slow mileage”), and you get to watch everyone start, finish, and have a great time. I have really enjoyed volunteering, and getting to know the other volunteers. 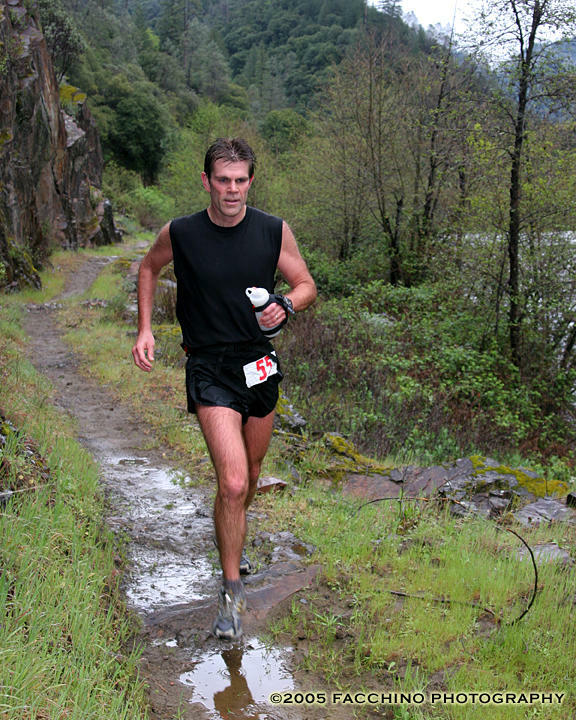 The Auburn Marathon was particularly fun because it was the first trail marathon in Auburn, CA, a location well-known for it’s scenic and challenging trails (read – Western States 100, Way Too Cool 50k, World’s Toughest Half Ironman, etc.). The canyon country in this area is gorgeous and full of gold rush history, so it's a great place to race. 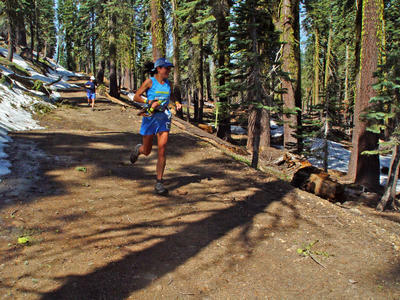 But doing an ultra/half Ironman is not for everyone, so when Redwood Trails put on a race in Auburn with marathon, ½ marathon, 9-mile, and 5k distances, many new trail lovers had a chance to come out and enjoy these historic trails. Not that the course was easy – even the 9-milers had to climb the dreaded “Goat Hill” all the way from the American River (my guess, about a 17-18 degree incline). Todd Mordhorst from the Auburn Journal summed up the race very well, so I copied it below (courtesy of Auburn Journal). For volunteering, I mostly did “trail marking” with Drs’ David Dreyfuss and Cynthia Moore. That means I was one of the people that ran/biked the course and hung up the orange ribbon before the race (and picked it up afterwards). It was a lot of fun trying to figure out where one could get lost and hanging the most appropriate sign (“wrong way” with a huge X is a popular and effective one for me personally). I probably hung way too much ribbon, but I know what it’s like to get lost out there. ;oP I don’t think any racers got lost this time, but we did have one person follow the marathon course accidentally, doubling her anticipated race length. But Roseann Favela pulled through and ran her first marathon! Nice job, Roseann! The Auburn Marathon also won the “best schwag” award from Runner’s World with their combo belt buckle, well-designed t-shirt, and a vial of locally-panned gold. The belt buckles were a huge hit (and went to EVERY finisher), and the vials of gold became a favorite “take home to the kiddies” trophy. Given the positive response, I have no doubt this race will have well beyond 200 racers next year. Some came to get a taste of the Western States Trail, some wanted to compete for prizes and get in brisk run and others were attracted by the complimentary gifts. Nearly 200 runners lined up Saturday morning for the first-ever Auburn Marathon and the event did not disappoint. The Auburn Marathon actually included a full marathon, a half-marathon, a nine-mile route, and a five-kilometer run, giving participants plenty of options. Add the Auburn Marathon to the ever-growing list of successful endurance events in the area. "To see the enthusiasm at the end of the race - these people were jumping out of their pants," said race director Eric Gould. "They got to experience the trail, the course was really well marked and we got lucky with the weather. We'll be back again next year." Lincoln resident Michael Fink, running in what he said was his first marathon, ran to a blazing time of 3 hours, 18 minutes, 31 seconds to win the marathon. "I had to do a check to make sure he did the entire course," Gould said, referring to Fink's outstanding time. "We looked at his tag and at first we thought he was a half-marathoner. He finished about 15 minutes before we expected anyone to finish this course. We were really taken by surprise." Fink finished more than 17 minutes ahead of Brad Lael, who took second. Tina Ure, a Placer High graduate now living in Mt. Shasta, was the first woman across the line, clocking in at 4:18:26. Ure, who ascended Mt. 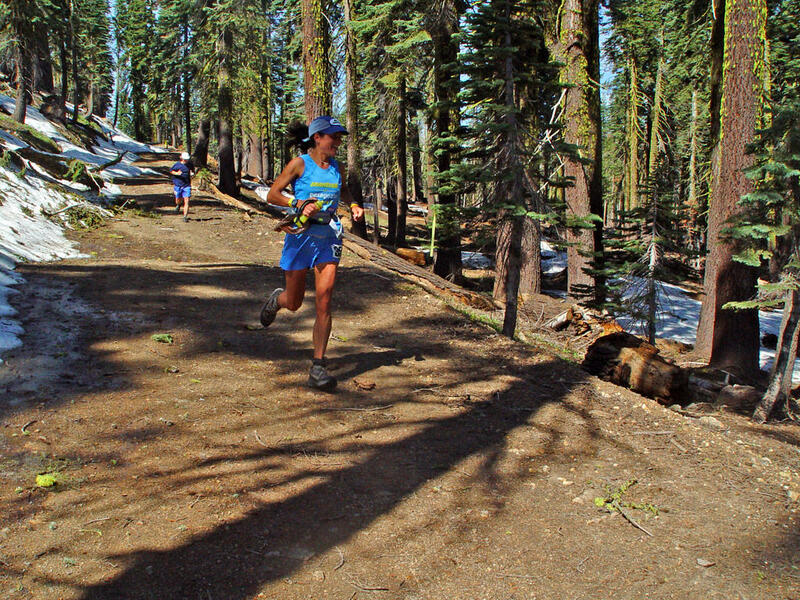 Shasta on foot last year, was the eighth overall finisher. Karalee Morris was second on the women's side and ninth overall.In the half-marathon, Gerell Elliot was the first to cross the line with a time of 1:45:29, edging Andrew Jacobson by just under three minutes. Kim Kortz was the top finisher in the women's half-marathon in 2:15:34, just ahead of second place Brenda Travers. In the nine-mile version of the event, Andrew Schwaab claimed the top prize in 1:12:20 while Maurisa Rodriguez was second and the top female finisher, clocking in at 1:31:33. In the 5K, Western States veteran John Trent, of Reno, finished first with a time of 21:58. Pete McKesson crossed the line second, just ahead of Sandra McKesson, who took first among females. Every finisher - there were 80 in the marathon alone - took home an assortment of prizes that was awarded "Best Schwag" by Runner's World magazine before the event even took place. Gold belt buckles were awarded to each finisher along with a vial of locally mined gold. The race T-shirts featured emblems with the belt buckle. Gould said the unique gifts were very well received. "The belt buckle and the gold were the real different things that people responded to," Gould said. "A lot of people really liked the gold, which was worth about $5 retail." Gould, who works for Redwood Trails which organized the Auburn Marathon, said he hopes to grow the event to around 500 participants and said it may draw that many as soon as next year. Redwood Trails, based in Redwood City, puts on outdoors events all over Northern California with the goal of getting people out to enjoy nature. "I wanted to put on a race that brought people out to the trail," Gould said of the Auburn Marathon. "About a third of the runners Saturday were running their first marathon and we had a lot of local people. A lot of people are intimidated by the trail, so we wanted to provide the entry level stuff so people can get into trail running without doing an ultra."